Our Jet Fighter Sculpture is one of the oldest in our portfolio, but one of the most popular. 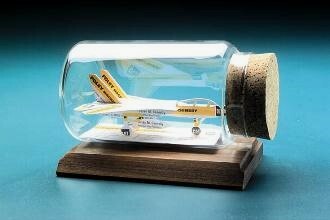 It’s a unique gift idea for Air Force pilots or an award for pilots, flight crew or ground crew members. Manufacturers use them as promotional items or to celebrate a big contract. One idea we liked was someone ordering the Jet Fighter Sculpture for someone who retired from the Air Force and entered a civilian job. The gift was made from the first 20 business cards from the new job! Air Force gifts of distinction from Business Card Sculptures! For other gift ideas for military pilots, click over to the C-17 Globemaster sculpture or the F-22 Jet Fighter sculpture. Also, gift ideas for helicopter pilots!